symmetry in petiole and blade. blooming at the vanishing point? We started with a strategy, but to paraphrase John Lennon, art is what happens when you get busy making other plans. Our idea had been to wander around the New York Botanical Garden, independently and together, with camera and notepad, to dig for content. The Enid A. Haupt Conservatory and the 250-acre-garden grounds, seemed, especially in winter, like good locations for capturing germination and mutation. We had planned to spend time looking, photographing and writing on our own. Then we’d find a particular “thing” that called to us and share that beloved treasure (plant, sculpture, architecture, whatever) with the other. Once material was generated, studio work would proceed. The best-laid plans went awry at the ticket counter when we learned we wouldn’t be able to visit the Conservatory (the place with all the cool plants) due to a holiday show. So we walked around the grounds. Frustrated by the lack of access, we peered from the outside into the beautiful hothouse, looking at the weird and wild plant life that pushed at the paneled glass. This decision proved fruitful. From the outside looking in, Steve found and photographed leaves and reflections. Pam was intrigued by the way exotic plants seemed to clamor for escape, and by the layering of cityscape and Edenic scenery. Our stumbling block had become a platform for collaboration. Thanks Daniela for you thoughtful read and comments. And for the Bacon quote, which I’ll add to my notebook. 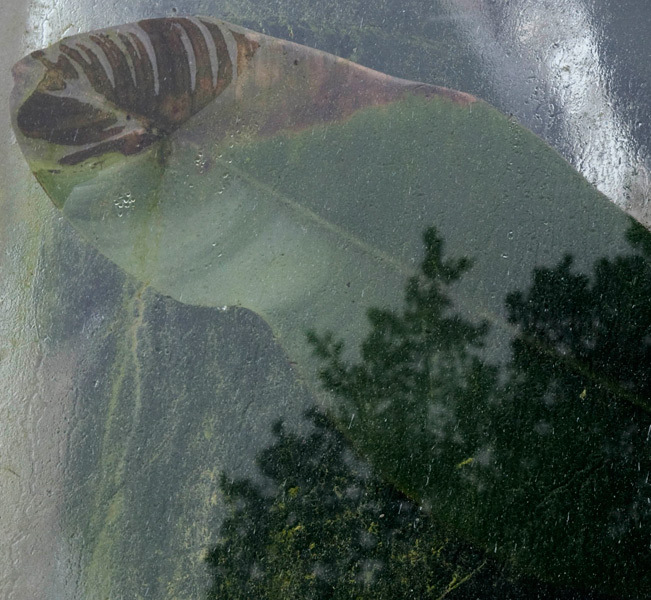 It looks rather primordial in there, and the leaf seems to have an air of quiet desperation as it presses at the glass. I like “worn symmetry” -that must be what the brain itself eventually becomes. A lovely poem produced from potential disappointment.